This blog was birthed on February 13, 2012, on the cusp of my two failed attempts to donate one of my kidneys to Mitchell. God put it on my heart to help this young man, that much I knew for sure…and if a kidney wasn’t coming out of my torso, then I would be used in another way. Savemitchell.com came to life to tell his story, share updates, as well as establish a Facebook page for supporters to follow along on his journey. We’ve raised thousands of dollars, created Save Mitchell dot com t-shirts (over 100 sold and counting), and even had folks make homemade dinners for the family. 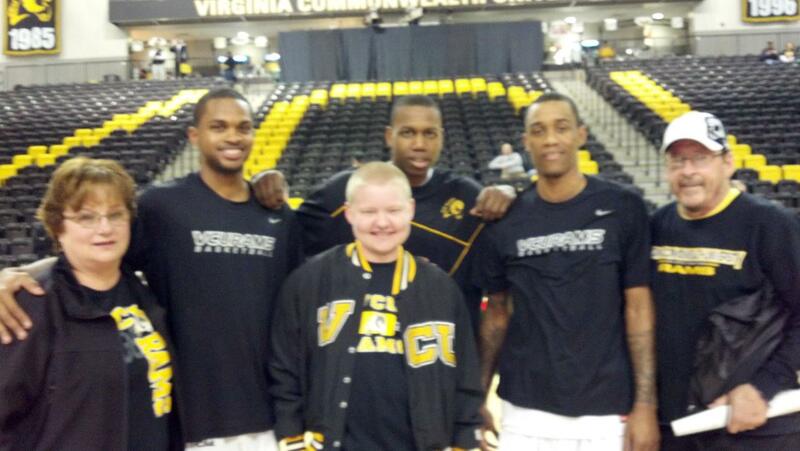 We chronicled Mitchell’s triumphs outside of the operating room including getting to meet his favorite college basketball team (VCU Rams), watched him graduate high school, and attend Prom. We’ve also learned about the not-so-glamorous, behind-the-scenes look at life on dialysis. As his Mother candidly said in the recent past, “he’s the sickest he’s ever been.” That statement says a lot considering the guy has been dealing with kidney failure and survived two transplants in the last 11 years. Needless to say, his loved ones and supporters have been clinging onto hope. That someway, somehow, someone would step forward to give the gift of life and be a suitable match. For a while he was doing well, then him and his Mom went to NC about two weeks ago to visit family, and suffered a complication thru dialysis — he was in a lot of pain. Things seem to be doing better now. No updates on donors. The hospital is working on a ‘domino’ transplant that could involved 8 donors/recipients so the testing and matching process feels like it’s taking forever. Thanks again for reaching out & the support! Fast forward to a few weeks ago, we learned that someone named Jessica was being tested. In organ donation, the hospital coordinator keeps details confidential to protect everyone involved, including HIPAA laws (patient privacy), so his family & I were grasping for any and all information which was loosely shared. The stories and status changed every few days — one moment we’re talking about people in Missouri and Pennsylvania participating in a domino swap, the next moment we’re focused on fixing his dialysis machine, and the next moment we’re anxiously awaiting any update whatsoever from the transplant unit. Well today was the day we’ve all been waiting for — this is finally happening in six short days. Mitchell has a donor, and it’s all thanks to sweet, selfless, super hero Jessica. She is donating to a stranger (known as “altruistic”) in need of a kidney in Richmond, VA — and her husband will donate their kidney to Mitchell. Although just like when I tested, Jessica wasn’t a match for Mitchell, the beautiful thing is she’s now saving TWO lives. The odds of this entire situation happening are slim on multiple levels. For one, given Mitchell’s complicated history and multiple surgeries, has unfortunately made it very difficult to find strong matches; it’s not as simple as having the same blood type — the process is much more involved including antibodies, tissue matching, etc. Additionally, to have the swap take place in the exact same city is amazing. Dealing with dozens of people in a large kidney swap could have delayed the surgery for months, not to mention more room for error. Finally, Jessica is a nursing student and starts school soon — so her timeline to undergo the surgery and build in time to recover is tight. But, by the grace of God, the stars aligned. Sure many hiccups could take place, causing the surgery to not happen , or complications from the transplant…but we’re not going to focus on that. No-no, we’re not even going to put an ounce of energy into What If? Because life doesn’t work that way — we are only guaranteed today, so let’s put our love and support into a perfect outcome for every single person involved. Let’s let go & let God. Let’s be brave and believe. I asked Jessica if she’d write a guest blog post to share her perspective, what this experience means to her, and why she was inspired to get involved. She happily obliged and titled it: A Gift. Her story brought me to tears for more reasons than I could ever explain… I’m so grateful for everyone’s support, and lift up Mitchell, his family, Jessica, and her family ~ that Tuesday, August 7 is The Day that Love wins, Faith perseveres, Hope prevails, and we’re no longer here to Save Mitchell ~ rather, Mitchell is saved. If you watch the news I’m sure you’ve seen stories about families in need or those who have experienced tragedy through no fault of their own. Typically the story ends with someone making a plea for assistance and all too often we change the channel or shrug our shoulders while silently thinking “I wish I could help, but I just don’t have the means right now.” We move on with ours lives because that story wasn’t our story and seemingly there was nothing we could do. Well one day I read a story and decided to do something about it. Back in April I came across a post on a Facebook friend’s page about SaveMitchell.com and remember reading about Mitchell’s story and imagining what kind of struggles his family and he must be going through. His sister, Mary Elizabeth, and I went to the same high school and lived not too far from each other. After learning about Mitchell’s situation I decided that I was going to do whatever I could to help him and his family. I began my research on the topic of living kidney donation and after a couple of weeks decided that I was going to get tested to see if I was a match. What ensued were several weeks of testing to be sure I could be medically cleared for the surgery. I was finally cleared but was told that the testing for Mitchell’s donor was a bit more extensive considering his past transplant history. So after some more blood work it was decided that I was unable to be Mitchell’s donor. While I felt a sense of disappointment, I was determined to help Mitchell in any way I could. Talk then turned to starting a chain where ultimately Mitchell would receive a kidney from a suitable donor. I was game for this as it got Mitchell the kidney he needed and it helped even more people! The last several weeks were full of blood work and frequent changes in the plan for donation. But today we finally got the news that we would be involved in a local swap, whereby Mitchell would receive the kidney he so desperately needed along with another person eagerly awaiting a kidney. I cannot explain in words how excited I was for both my recipient and for Mitchell and his family!! After weeks of testing and countless tubes of blood we finally had an answer and it was exactly what we all wanted to hear! Why am I doing this? That’s a question I have been asked countless times along the way. My answer has the same premise every time: Because I am able and because someone needs it. It doesn’t matter if they are a stranger, a dear friend or a family member, they are a human and are in need. I firmly believe that this is something I am meant to do and it is something that comes from my heart. I hope that I can inspire others to donate or to simply take the time to help those that truly need it.